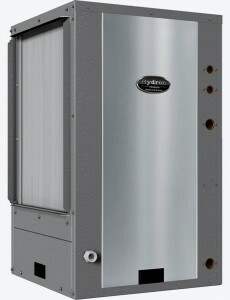 The Hydron Module is the pinnacle point for geothermal heat pump systems that have to operate reliably during a wide range of water temperatures. Hydron concentrates on building the highest quality heat pumps using innovative features such as micro channel all-aluminum coils, expanded foam insulated water coils, double vibration isolated compressors, ECM fan motors, and easy maintenance access. Hydron offers all of these features and boasts the smallest cabinet size in the industry with the highest efficiencies. Hydron won the “dealer design award” in 2015 for its innovative design and quality. Turn to Hydron for your next geothermal project with its complete line of water-to-air and water-to-water heat pumps and together we can create a durable, green, and space-saving mechanical design.